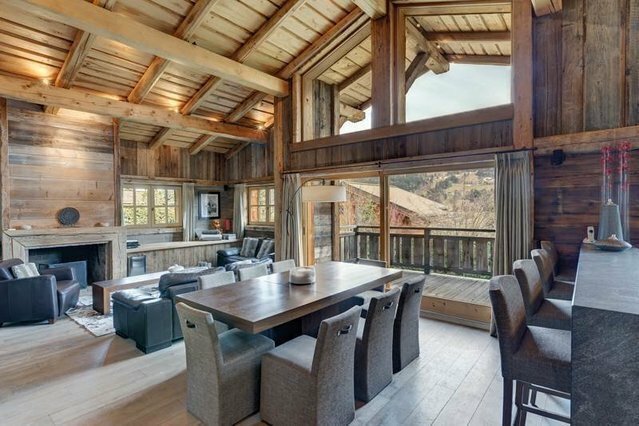 DEMI-QUARTIER, SUPERB CHALET REF. 6088, built in front of the Mont-Blanc, located in a quiet, sunny and residential area at only 3km from Megève. Comprising of: Beautiful living room with fireplace, open-plan fitted kitchen, dining area opening onto a South-east/south-west-facing corner terrace, mezzanine, guests' toilet, five bedrooms, three bathrooms and one shower room, laundry, dressing room, cellar and garage. Total floor space: 189 sq.m + a 30 sq.m garage. * Fees to be paid by the seller.